There are several peaks throughout the year for whale sightings. It is possible to see whales any day of the year and every trip we go on is different. The peak of the Southbound Gray Whale migration is during the middle weeks of January. If you were to sit at Pt Pinos in Pacific Grove and watch whales all day, you could see more than 30 whales an hour during this time of year. We often see large groups of whales passing through the area on their way to Mexico. It is also possible to see humpback whales who have chosen to spend the winter in Monterey. 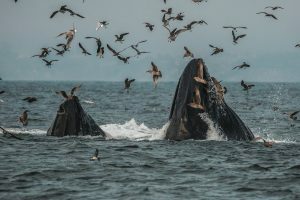 Humpbacks have become more common during the winter months as the population recovers and there is an abundance of food in the bay. We typically see a variety of dolphins year-round. Winter time dolphin sightings include pacific whitesided dolphin, northern right whale dolphins, common dolphins and occasionally, bottlenose dolphins. This time of year, brings an amazing mix of wildlife. The northbound gray whales are passing through Monterey Bay, including moms and calves. This is also the peak time of year to sight killer whales (otherwise known as orcas). As the spring season progresses, our local humpbacks will return to the bay for the summer and fall seasons. We tend to get afternoon wind from the Northwest most days, which drives the enormous upwelling cycle in the bay. Upwelling is the key to our local ecosystem, creating a huge abundance of life in a very dense area. Other species that could be sighted this time of year are blue whales, fin whales, and a variety of dolphins and porpoises! Summer season is feeding season! Our local baleen whales such as humpback, blue and fin whales are attracted to the abundance of food in the Monterey Bay National Marine Sanctuary. In particular, the rich waters in the network of submarine canyons in the bay. The spring and summer upwelling brings cold, nutrient rich sea water to the surface fertilizing all the phytoplankton, which is the base of the food chain. This concept is called “Wind to Whales”. From mid-July to early October we regularly see feeding whales on our trips. Our main species which is sighted daily is the humpback whale. It is also possible to see blue whales, fin whales, killer whales (aka orcas), and a variety of dolphins. Fall is another great mixing time. We usually have some stretches of favorable weather in the fall as the upwelling season comes to a close. There is still plenty of food in the canyon network in the bay which keeps the whales here until late November some years. As our feeding whales start to slow down and leave the area for migration, many more are passing by the coast. 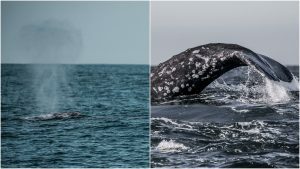 It is also possible to see a variety of dolphins, northern elephant seals, killer whales (orcas) and a few early gray whales. We can see a variety of pinniped, birds, fish, shark and invertebrate species throughout the year as well! We see southern sea otters almost every single trip in addition to california sea lions, and harbor seals in or near the harbor. 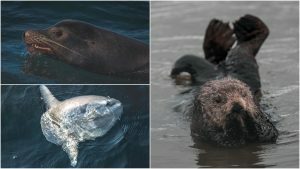 Some of our less common pinnipeds such as northern elephant seals, northern fur seals and guadalupe fur seals are seen in deeper waters in the bay during trips. Often times we sight ocean sunfish or Mola mola during our trips and we will stop and take a look at one while it is basking at the surface if we can. If you are interested in seabirds, we have a wonderful variety of species in the bay throughout the year and our marine biologists and naturalists will help point them out to you. We occasionally see sharks, but they tend to be very skittish around the boat, so most encounters are a passing glance. There is a huge variety of invertebrates such as jellyfish and salps that we can see during our trips, our crew will point them out to you if there are large abundances of them near the boat. 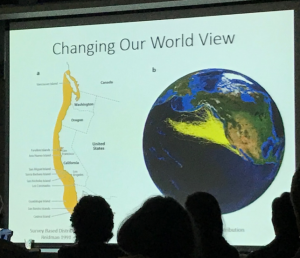 Check out reflections and notes from our crew as they attend lectures and conferences in the marine education, science and conservation realm. Our crew is encouraged to attend lectures and events to keep up to date on the latest information in the field. While it would be extremely rare for a bowhead whale to be sighted in Monterey Bay, it was fascinating to hear about a species that spends its whole life cycle in extreme ocean conditions near the north pole. One of the coolest facts about bowhead whales we learned was that they can break through ice up to .5 meters (1.5ft) thick! The biggest take away from Kate’s talk for us was a renewed inspiration that we still have much to learn about the ocean. Her project was taken under with the expectation that they probably wouldn’t hear too much on the stationary hydrophone when they originally deployed it. They were pleasantly surprised to hear singing, not just feeding calls or other calls, but actual mating calls. They also heard calls very consistently and clearly for weeks at a time. This was an incredible discovery and has major implications for conservation of bowhead whales. This also reassures us that we can use emerging technologies to really get detailed information about these mysterious species and the extreme environments they live in, there is still good work to be done! The footage that comes out of the Goldbogen Lab is always jaw dropping. 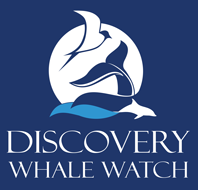 They are located just down the street from us at Discovery Whale Watch, working out of Hopkins Marine Station, and they often deploy camera tags on our whales in Monterey Bay. They have taken critter cam to a whole new level. It has been fascinating to watch their work over the last few years as they study the dynamics of feeding groups in the bay and also the biomechanics of the whales while feeding. They newest and most exciting update for us was that they are testing new camera’s that will show what all the other whales around the tagged whale are doing during group feeding. So not only will the whale report on its own behavior, it will also report on the whole group’s behaviors. Using the whales as your data collecting device with temporary suction cup attached tags is such a brilliant idea and technology keeps getting better and better to support it. The new tags will be more of a 360 camera so that researchers can see all directions off the side and above the whale as it swims around. The data they have now is based on the front and rear view of the tags and it doesn’t usually show too much of what the other whales are doing when they are feeding in a group. Are they organized? Or is it just chaos? Hopefully these tags will help us find out! As we sat in Joy’s talk we reminisced about being at this same venue 4 years ago and hearing about this same topic. In just 4 years, the knowledge in the field about cetacean vocalizations has expanded enormously. We were thoroughly impressed by all the detailed information available now about how whales and dolphins make sounds and how they move air around their body to do so. As Joy explained the anatomy of the larynx of baleen whales and toothed whales she also explained the implications of what this means for sound production. Just 4 years ago at this conference we didn’t even have a clear picture of what the larynx really looked like let alone how it functioned entirely. 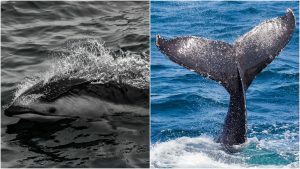 (2014 conference approached question from perspective of cetacean hearing / sound reception mostly) One over-arching question that is still being worked out is: Can cetaceans disconnect / reconnect their larynx at will? It seems like they must be able to for the following reasons: they can produce bubbles from their mouth at will, and it would make sense when looking at how they control their buoyancy in shallow water (video evidence was shown) showing that they can move air back and forth between their lungs and their head/throat (baleen whales). In cetaceans, the blowholes are connected to the trachea and lungs but the mouth is connected to the esophagus and stomach, so air shouldn’t be able to come out of the mouth at will. This seems like an incredibly risky maneuver to disconnect and reconnect the larynx since the risk of drowning becomes much higher, but maybe it’s worth it? 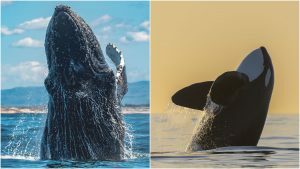 Two new facts we were impressed by with mysticetes (baleen whales) was that they can indeed make two distinct sounds at the same time when vocalizing due to the compartmentation of their larynx. They also tend to vocalize in a “head down” position to project the sounds coming out of their throat on a horizontal plane, this also aids in air shunting between the lungs and the throat while at depth and experiencing higher pressures. One new fact we learned about odontocetes was that they intentionally inflate the air sacs in their sinuses at the surface before a dive, so that they are not drawing air from their lungs for vocalizations while at depth. This helps them maximize their oxygen capacity at depth for longer dives. This does make a lot of sense based on what we know about how odontocetes pre plan their dives, and how they have a lot of control over how to best calibrate their body during dive planning at the surface. It’s like inflating the bags on a bag pipe before you play. Dara’s talk mostly focused on female avoidance behaviors when males are attempting to mate with them, or harassing them. She looked at behaviors exhibited in harbor porpoise in San Francisco Bay and dusky dolphins in the South Pacific. The question that Dara was trying to answer had to do with copulatory fit, so how well the male and female anatomy connect during mating. For cetaceans this is a lot trickier since they live in water. One of the most interesting facts we gleaned from this talk (in addition to some adult humor) was that male harbor porpoises always approach a female from behind and on her left. This is the only physical approach that works for copulatory fit between the male and the female. If you happen to see a harbor porpoise swim very fast from the left and then breach on the right of another one, you may have just observed mating. It really is less than 3 seconds for the whole occurrence to take place. Another interesting observation that Dara made is that harbor porpoise females seem to ovulate the most in the summer, so there may be seasonality to their mating and births throughout the year. Northern elephant seals are pretty incredible animals. They are a deep diving pinniped that made an amazing recovery from near extinction. At the end of the commercial seal hunting industry there might have been fewer than 100 Northern elephant seals along the west coast of North America. Dr. Costa’s talk really started to reveal some of the finer details of how these animals have now recovered to an impressive 124,000 individuals in California alone. Dr. Costa first showed some figures about how population & range estimates were done in the early days of elephant seal research by flying survey planes along the beaches throughout the year. The estimates of what types of marine habitat that elephant seals used was really narrow and didn’t really match with how many seals were counted on the beaches during molting and breeding. Not many seals were seen at sea. Once scientists were able to put satellite tags on the seals and track them out at sea, they realized that the range of elephant seals was woefully misrepresented by the aerial surveys. Northern elephant seals cover THOUSANDS of miles while foraging out in the open ocean. The photo below shows the original coastal surveys in yellow on the line drawn map of the West Coast of North America from Mexico to British Columbia. The Google Earth map shows the yellow track lines obtained from satellite tags on elephant seals. What an enormous difference! Now that it was becoming clear that elephant seal use thousands of miles of open ocean habitat, there was a whole new set of questions to go along with it. What were they doing? What’s out there? It turns out that elephant seals use all that habitat for feeding. So what’s out there that’s so tasty? Scientists started developing more sophisticated tags to start to answer those questions. Over the years there have been many versions of tags tested and used on elephant seals and they have been able to collect an incredible amount of data. Using these tags, scientists have learned that elephant seals can dive for almost two hours and to depths around 1500m. On average they feed in zones in the ocean that are about 600m depth and in total darkness. Elephant seals eat fish and invertebrates that live in the mesopelagic zone of the open ocean. Beaked whales feed in this same zone of the ocean! Unlike beaked whales, elephant seals do not have the ability to echolocate or use biosonar to detect prey while feeding at these depths. So how do they find food? Scientists are still working on the finer details of that, but they do have extremely long whiskers and large eyes. 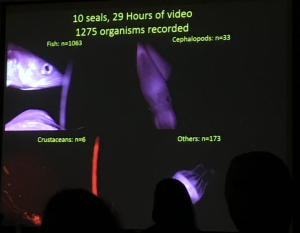 Dr. Costa speculates that elephant seals are likely a visual predator at depth, and are able to see the bioluminescence of the food they eat. Elephant seals seem to have some incredible sensory input from their ocean environment. Video camera and new satellite tags have shown that elephant seals forage in the oxygen minimum layer and zones of higher productivity called mesoscales. Can they detect these zones in the ocean? Or is it more coincidence? What are they detecting? Those questions are still being worked on but it seems that they are strategically targeting those zones. 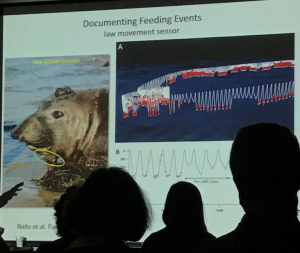 One of the more complex tags used on elephant seals is a video camera tag triggered by an accelerometer on the bottom jaw of the elephant seal. This tag is used to capture photo and video of what the elephant seals are eating. The camera turns on when the seal reaches 500m in depth and then begins filming when the accelerometer detects that the seal is opening and closing its mouth regularly to indicate that it’s feeding. So, elephant seals are taking videos while they eat and this allows scientists to identify the species that they are eating! Check out the picture below. Some other really interesting studies that have been going long term with Northern elephant seals are pregnancy success, foraging locations and route fidelity, and oceanographic studies. Elephant seals really are good study subjects and great tagging candidates because of their normal life history. They come to the beach twice a year on a regular schedule and tend to come back to the same beach every time. They are not very skittish around humans which makes them easy to approach and work with on beaches. They also molt annually, giving you an easier opportunity to get a tag back once you have glued it to the fur of the seal. Many females have been studied over the years and some interesting conclusions and information have come about from all the tag data. Scientists know that pinnipeds have delayed implantation after mating and elephant seals probably experience implantation during their molt after they have been out at sea recovering muscle and fat from the winter birthing and mating. Elephant seal females usually pup every season when they are at the peak of their reproductive years. When tagged elephant seals are out at sea, their dive profiles show if they have a successful pregnancy or if they lose the fetus out at sea. As the fetus grows the female’s buoyancy increases and she cannot dive for as long nor as deep. If she loses the fetus at sea, she will go back to the same depths and dive durations of a non-pregnant female. This can give scientists an estimate of how successful each cohort and season was for pups. Often the amount of pups born each season is a reflection of ocean conditions. Dr. Costa states that elephant seals are going to be less susceptible to oceanographic changes in the future for several reasons. One reason is how much ocean habitat they use while foraging. Another reason is they can detect more productive areas in the open ocean habitats better than many other species. The last reason is they fit the ultimate model of survival of the fittest. In bad pup years (overall numbers of pups born), the pups that do survive to a successful weaning are more robust than pups that survive to weaning on years with more numerous pups. A good example of this was in 2015, as the warm water blob was prevalent off the west coast of North America, that was also the biggest year of failed pregnancies at sea and low numbers of pups on the beaches. The two more recent studies taking place with Northern elephant seals are fascinating. The first study is more that elephant seals are collecting data for another study. Elephant seals are being used as living oceanographic gliders or sampling devices when out at sea. The tags that are attached to them for studies about their own species are also outfitted with sensors to collect oceanographic data at the same time. So, elephant seals are helping oceanographers understand sea conditions in real time with a much higher resolution than before! The second study which is really just beginning for elephant seals, is to determine how much nature and nurture play a role in elephant seals foraging success. To understand why that could even be studied in elephant seals we need to step back a little and review the nurture part of elephant seal life history. When elephant seal pups are born, they only spend about a month with their mom and no time with their dad. Once the female has weaned the pup, she abandons it on the beach and doesn’t have any apparent contact with it for the rest of its life. The elephant seal pups have such a thick blubber layer by the time that they are weaned that they can lay on the beach slowly starving for about two months. During this time they are learning on their own and with other pups in their cohort how to swim and find food. By the time they head out for their first open ocean swim, to really learn how to be an elephant seal, it’s spring time and they seem to have it all figured out. But how? No adult is there for them to role model after or learn from. Quite a bit of this knowledge then must be innate, so they are born with the knowledge. Some females as adults take the same route each year while out at sea to find food. Other females take an entirely different route each year they go out to find food. The females with high site fidelity are playing the averages while the females with low site fidelity are gambling that each year could pay off big. High site fidelity is a favored strategy when ocean conditions are stable, while low site fidelity is a more successful strategy when ocean conditions are unstable (ex: warm water blob event). In the face of changing oceans there may be more selection for females who exhibit low site fidelity preferences. Is this site fidelity genetically innate also? Scientists are going to try and correlate reactions to foreign or novel objects on the beach with site fidelity preferences to get closer to an answer on that question. Maybe this is correlated with risk taking behavior and could further provide evidence for how much of elephant seal behavior is innate and how much is learned. Since 2008 the Monterey Bay National Marine Sanctuary has included a seamount within its boundaries: Davidson Sea Mount. Dr. Andrew DeVogelaere spoke at Science Sunday about explorations and comparisons of Davidson Sea Mount, Sur Ridge and the Monterey Canyon. NOAA (National Oceanic and Atmospheric Administration) has been studying the deep-sea habitats of Monterey Bay National Marine Sanctuary with remote operated vehicles (ROVs) and underwater autonomous vehicles (UAVs). Since 2002 they have documented and classified 19 new species during their explorations. Some of the most impressive creatures they document are deep sea corals. Deep sea corals can live thousands of years. They are very slow growing invertebrates that in shallow water create a symbiotic relationship with algae to share resources and food. In the deep sea, the corals are carnivores that feed on marine snow – small particulate matter that float in the water column. The corals at Davidson Seamount and Sur Ridge have been aged with carbon dating to 1500+ years old. Corals lay down growth rings as they age. In these growth rings is evidence of changes in the atmosphere – some corals have radioactive signatures from when above ground nuclear testing occurred. In addition to corals growing slowly, sea water takes a long time to transit through the deep sea. When water circulates through the world’s oceans it can be at depth for over a thousand years before it reaches the surface again. The particulates in that sea water carry signatures of previous atmospheric conditions and nutrient compositions. Water that gets upwelled during the spring and summer season here in Monterey Bay has been in the deep sea for a very long time! As these deep-sea areas are explored, scientists are also observing the effects of human activity even in these environments. Dr. DeVogelaere had a good quote he used during his talk. “The creatures of the deep sea knew about us long before we knew about them”. Man-made debris is more prevalent at Davidson Seamount in comparison to the Monterey Canyon or Sur Ridge due to its proximity to the shipping lane approach to San Francisco. However, there is a shipping container on the sea bed in the Monterey Canyon that has been studied since it was discovered seven years ago. The container was tracked back to the ship and company it came from and it turns out the container was lost in rough seas south of Monterey Bay and was carried on the currents until it settled on the sea floor in the canyon. Our global problem with marine debris / pollution reaches even the most remote places on our planet. Marine snow now contains microplastics that settle on the sea floor so the problem isn’t even completely visible to the untrained eye anymore. We all should participate in daily conservation and become advocates for our planet in whatever small or large ways we can. Whether that means bringing a reusable water bottle with you, writing a letter to a company that uses plastic packaging, participating in a beach clean-up, or something else, we all can do something small each day.